Zydeco is defined by the integration of far afield music genres, purportedly taken from a french saying “I’m so poor, I can’t afford any salt meat for the beans." The news of FDA’s approval of Kalydeco on February 1, 2012 illustrates the conundrum of where we are in the decades long march towards personalized medicine. There is much to celebrate. It’s music to the ears of many that the we are now beginning to attack the root cause cystic fibrosis rather than the symptoms. And more importantly for all the other diseases with genetic causes, we’ve been able to actually design a drug that fixes a genetic defect. But there isn’t a ton of pork that would make our biomedical ecosystem beans taste great. The FDA approved the drug for an estimated 4% (1,200 of 30,000) of Americans who have a specific “orphan” form of Cystic Fibrosis based on the G551D mutation discovered by Francis Collins and Lap-Chee Tsui in 1989. The price per year for every patient matching the characteristics is among the highest ever at $300,000. While a person may not need to take the medicine forever, even at two years this is more than most people in the nation will earn in ten years. The time to develop this therapy from the initial discovery is almost as long as the life expectancy for a CF affected person - which is about 35 years. The accelerated approval by the FDA in just three months represents the culmination of over 20 years of effort. After 10+ years of research into gene therapy that didn’t result in any progress, the Cystic Fibrosis Foundation decided to invest ultimately $75M (with an unknown amount of $100’s of millions by Vertex) in experimental treatments. The companion funding and focus provided by this significant patient advocacy group appears to have at least reduced the cost (say $300M vs $1B for the average clinical trial) and partially the time (12 years vs the average 15). While perhaps there is potential for companion drugs or alternates that follow a similar pattern, and they might treat a large percentage of CF patients, it’s not likely to happen soon. Fundamentally, this advance represents why there is so much uncertainty and discord about the business model of biomedical research, what and when the value of the illumination of the human genome will be realized, and where we should invest to produce the most benefit. The simple, brutal fact is that there are diseases that can’t be expected to generate the sales (or health savings) to cover the cost of developing certain products. This influenced the creation of the NIH’s Office of Rare Disease Research, which was just brought into the new NIH Institute - the National Center for Advancing Translational Sciences (NCATS). Coordinating, consolidating, and directing resources around rare disease research is a growing exercise worldwide and there are a significant number in the categories of rare or orphan diseases (roughly 7500 diseases affecting as many as 35 million people - see the Rare Project). This may not just benefit rare disease research, discovery and treatment but affect how we should perform research generally. I hope so, or we will all be too poor to afford the results and only the rarest among us (rich, sick and uniquely predisposed) will benefit. And these same economics come into play with more common diseases that ultimately are discovered to represent a myriad of subtypes, each requiring a different therapy. 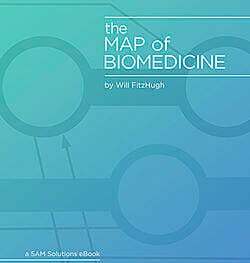 What is certain for 5AM is that the better we integrate the silos of data from across the biomedical ecosystem, visualize the data effectively for a wide audience of data consumers, and acquire the data from a range of connected devices, we will contribute to finding these answers sooner.